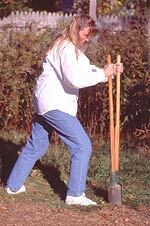 Grab yourself a post hole digger and dig a hole one foot deep. Plant the Squirrel Shield in the hole and pack in the dirt around it. That's it. You're done! You now have a squirrel quard. 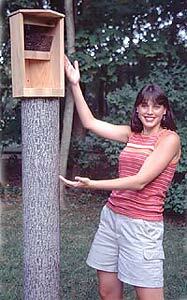 Place a bird feeder or nest box on top and the squirrels cannot get to it. 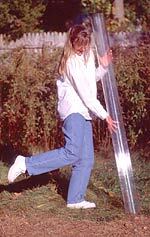 The "Squirrel ShieldTM" is a tall, clear, smooth, plastic, hollow cylinder that squirrels cannot climb. Most any feeder can be mounted onto the "Squirrel ShieldTM" with an "Adapter kit". 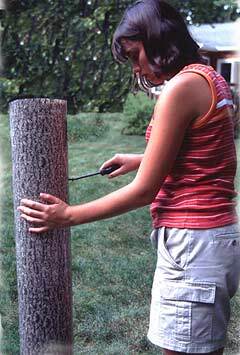 The Tree Mirage is a hollow cylindrical base for birdfeeders or nest boxes. It has a tree bark pattern to blend into the environment. And it is wide and tall to prevent squirrels and raccoons from climbing to the top. It is made of a lightweight plastic and fits snugly under most "Native America" feeders and nest boxes. 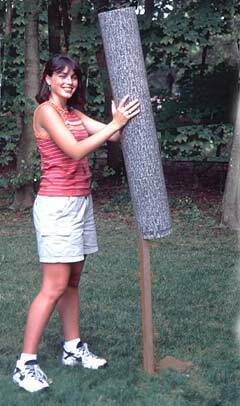 It can be screwed into an internal custom support pole or may be screwed into any standard wooden post. It fits over and may be screwed to a 2 x 4 post or a 4 x 4 post. Bird feeders are best placed upon a five foot Tree Mirage. All Native America nest boxes are adapted to receive the Tree Mirage. Simply chose an appropriate height of the Tree Mirage. The smaller nest boxes are best placed above the four or five foot Tree Mirage. 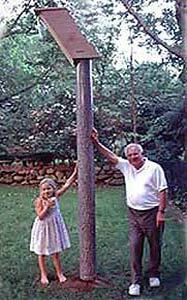 The larger Kestrel, Owl, and Wood Duck nest boxes are best placed eight to ten feet above ground. At eight feet, 2 four foot Tree Mirages can be placed one above the other on the pole. At nine feet, a four foot Tree Mirage can be placed above a five foot Tree Mirage. And at ten feet, two five foot Tree Mirages can be stacked one above the other on the pole.